The Kiribati Islands Football Association (KIFA) has been operating since 1980. KIFA’s main activities are the organisation of inclusive football competitions for all of Kiribati’s scattered islands and the promotion of football through the provision of much-needed equipment, coaching etc to local teams. 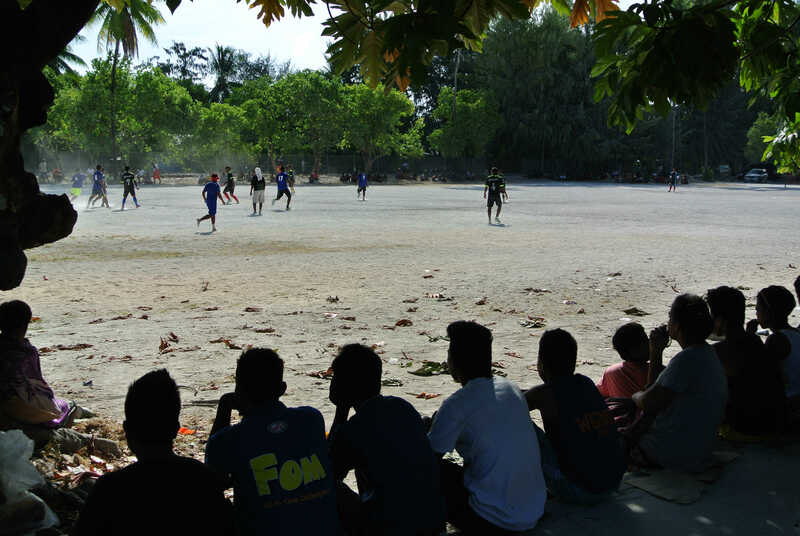 Despite the lack of space on Kiribati’s islands and atolls, our people love football and play at any opportunity. KIFA is firmly committed to the development of sport in Kiribati as a foundation to improving our performance at the international level. Our population demographics are heavily biased to the under 18 age group and we feel that football along with all other sports will provide an important avenue for development for our people. KIFA is an active member of the Kiribati National Olympic Committee (KNOC), who were recognised by the International Olympic Committee in July 2003, and an associate member of the Oceania Football Confederation. Since 2016, KIFA has been a member of the Confederation of Independent Football Associations (CONIFA). KIFA intends to send a national team to contest CONIFA tournaments in forthcoming years. The Republic of Kiribati consists of 34 atolls, reefs and coral islands spread across the Pacific Ocean. Kiribati gained independence from the United Kingdom in 1979, and has since become a member of the United Nations, Commonwealth of Nations, International Monetary Fund and World Bank. Kiribati has a population of just over 100,000, many of whom live in its capital of Tarawa. Due to the low-lying geography of many of Kiribati’s islands and atolls, climate change poses a particular threat to the island nation. Organised football in Kiribati can be traced back to the early 1950s, with teams from across the country playing for enjoyment on an ad hoc basis. Competitive matches between villages began to be held in the late 1950s, although strict rules were not applied. In the 1960s, committees began to conduct inter-village games to celebrate special occasions and public holidays. In 1980, a football association was formed to organise a football tournament between islands. The first national football tournament was held in 1984 and most outer islands participated in the event. National tournaments have been conducted on an annual basis since this time. In the early 1980s, workshops were conducted for referees and coaches, which generated greater enthusiasm for the sport among i-Kiribati. Kiribati had participated in the Pacific Games on three occasions: in 1979, 2003 and 2011. At these tournaments, Kiribati has played Papua New Guinea, Fiji, Tuvalu, Solomon Islands, Vanuatu, Cook Islands and Tahiti. The Kiribati national team is yet to record an international victory. The team has also played friendly matches again Nauru and visiting navy football teams from the United States, Germany and Great Britain. KIFA is actively seeking membership in the Fédération Internationale de Football Association (FIFA). Until that time, KIFA is looking forward to becoming an engaged member of CONIFA and participating in CONIFA tournaments. 1. Confederation: a group of Associations recognized by FIFA that belong to the same continent (or assimilable geographic region). 2. District competitions They refer to football competitions organized by one or two member association(s). 3. Executive Committee: It refers to executive committee of KIFA. 4. FIFA: “Fèdèration Internationale de Football Association”. 5. Football: the game controlled by FIFA and organized in accordance with the Laws of the Game. 6. General Assembly: It refers to the general assembly of KIFA. 7. IFAB: It refers to the International Football Association Board. 8. KIFA: It refers to the Kiribati Islands Football Association. 9. League: An organized football competition at a district level mandated by KIFA. 10. Member Association: A football association that has been admitted into membership of KIFA by the general assembly. 11. Member organization: It refers to other bodies that have been admitted into membership of KIFA by the general assembly. 12. National competitions: They refer to football competitions organized by KIFA whereby more than 3 member associations or leagues take part. 13. OFC: Oceania Football Confederation. Official: every board member, committee member, referee and assistant referee, coach, trainer, and other persons responsible for technical, medical and administrative matters in KIFA. 15. Player: any football player licensed by a member association or club. term in the singular applies to the plural and vice-versa. 1. There shall be formed an organization known as the “Kiribati Islands Football Association”, hereinafter referred to as “KIFA” in compliance with the Kiribati Sport Act 1999 of the Republic of Kiribati. 2. The head office is located in Betio, Tarawa, the capital of the Republic of Kiribati and may be transferred to another location following a resolution passed by the executive committee and adopted by the AGM. 3. The Kiribati Islands Football Association is hereby formed for an unlimited period. 4. The Kiribati Islands Football Association shall be neutral in matters of politics and religion and it will not entertain any form of political, religious, sexual or racial discrimination. 5. The Kiribati Islands Football Association is a member of FIFA and OFC and accordingly it shall respect the statutes, regulations, directives and decisions of FIFA and OFC and it shall ensure that these are likewise respected by its members. 4. To control and supervise all friendly football matches of all forms played throughout the territory of Kiribati. 5. To manage the international sporting relations connected with football in all its forms. 6. To protect the joint interests of its members. 11. To liaise with the Kiribati Sports Authority (KSA) on matters necessary for the promotion and development of football. 1. The flag of the Kiribati Islands Football Association depicts a canoe sailing in the sea between two islands of coconut trees separated by sea and three frigate birds flying over the islands. The background is light blue for the sky and dark blue for the sea. 2. The emblem and the logo are the same as the design of the flag. 3. The abbreviation of the national association is `KIFA’. 1. The official languages of KIFA are the native I-Kiribati language and English and documents and texts of the Association shall be written in these two languages. 2. In the event of any divergence between the interpretations of texts in the two languages, the text written in the English language shall prevail. (c) the referees’ group subordinate to KIFA. whose admission has been approved by the general assembly. (c) a declaration to the effect that the legal composition of the applicant guarantees that it can make decisions required by its affiliation to KIFA independently of an external entity. 1. Every application for affiliation to KIFA must be submitted in writing to the general secretariat. (k) a declaration to observe KIFA’s rules governing the conduct of football and Laws of the Game of FIFA in force. 1. The general assembly of KIFA has the sole right to decide on the affiliation of a member. 2. Affiliation may not be refused unless the organization of the applicant is incompatible with these statutes, and with Article 6 in particular. 1. The clubs make up the leagues in the championship in which they take part. 2. The leagues are subordinate to KIFA, which approves their statutes and regulations along with any amendments to the same. 3. KIFA delegates to the leagues the rights and obligations required to achieve their statutory objectives. (h) all other rights arising out of these statutes or those recognized by the regulations, directives and decisions of KIFA. (l) all other obligations arising out of these statutes or out of the regulations, directives and decisions of KIFA. 1. Serious breach of the statutes, regulations, directives and decisions of KIFA may result, subsequent to the decision of the general assembly, in the suspension of the membership of a member for a maximum of two years. 2. In an urgent case, the executive committee may impose a provisional sanction of this kind. In this case, the suspension shall come into effect only until the next general assembly, which must come to a decision on this action. 3. Any decision on suspension implies the loss of the rights and obligations associated with member status while the suspension remains in force. 1. Member status is terminated by the resignation of the member, its expulsion or dissolution. 2. Loss of member status does not relieve the member from its financial obligations to KIFA or other members. Suspension cancels all rights in relation to membership in KIFA. 1. A member may submit its resignation in writing to the General Secretariat and this is effective forthwith. 2. The letter of resignation from the members shall be signed by three members of the executive committee of the member organisation. The general assembly may expel a member for a particularly serious breach of the statutes, regulations, directives and decisions of KIFA. 1. The general assembly may dissolve the executive committee for a particularly serious breach of the statutes, regulations, directives and decisions of KIFA. 2. The general assembly may suspend a member on the recommendation of the independent auditor who finds from his audit that the member is insolvent. (e) the judicial bodies (disciplinary committees, appeals bodies). 3. The chairperson of the standing committees shall be designated by the executive committee from among its members. The chairperson, deputy chairperson and the members of the standing committees shall be in office until the election of a new executive committee. 4. Each chairperson shall represent his committee, see that its business is properly conducted, fix the date of the meetings in conjunction with the general secretary and report to the executive committee on its work. The general assembly is the supreme authority of KIFA and it shall be held every two years or during the national competitions. 2. Each member shall have the right to one vote and be entitled to be represented on the general assembly by a maximum of three delegates, all of whom may only take part in the debates. 3. Only the delegates present and entitled to vote shall decide any questions put to the vote. 4. Likewise called to the general assembly in a consultative capacity are the members of the executive committee and the general secretary and those endorsed by the President or Vice President to attend the general assembly. 5. No delegate shall be allowed to represent more than one member organization. 6. During their term of office, members of the executive committee shall not be eligible to act as delegates of their leagues or member associations. 7. Delegates to the general assembly must be “bona fide” members of the affiliated leagues or member associations they represent. 2. Official delegates must be in possession of a proxy granted by the members being represented. They must be able to produce evidence of this as required. (n) revoking the mandate of one or a number of the members of an organ of KIFA. 1. The ordinary general assembly shall meet once in two years or during the national competition. 2. The president, vice president or general secretary shall call for meetings of the ordinary general assembly. 3. The agenda, specifying the nature of the business to be transacted, the president’s report, the balance sheet, the auditors’ report, date and place of an ordinary general assembly must be notified to affiliated members by registered letter posted at least three weeks in advance or one day in advance if the ordinary general assembly is convened during the national competitions. 4. All proposals and questions to be submitted to the ordinary general assembly by members must be sent in writing to the general secretariat at least two weeks before the ordinary general assembly. Only those proposals and questions sent in time and included in the agenda may be discussed at the ordinary general assembly. 8. The ordinary general assembly may, in emergencies, deal with matters submitted after the above closing date, provided an absolute majority of the members affiliated to KIFA (which have not forfeited their right to vote for any reason at the time of the ordinary general assembly) is present and a simple majority of the votes recorded thus decides. 9. There shall be a sitting allowance of $30 for all members attending the general assembly. 10. Subject to approval of the general assembly, there shall be no sitting allowance payable if KIFA does not have the necessary resources to meet these costs. In this case, KIFA will provide bus fares to members attending the general assembly. (k) Admission, suspension and expulsion of a member. 2. The agenda may be modified provided a simple majority of those present at a general assembly are in favor of the modification. 1. The executive committee may convene an extraordinary general assembly, if it deems this to be necessary. 2. When at least a simple majority of all affiliated members submit a request in writing and signed by at least three members of the executive committee of these member associations, the executive committee is obliged to convene an extraordinary general assembly no later than two months after submission of the request. As a last resort, the members can refer the matter to FIFA. 3. The place, date and agenda of an extraordinary general assembly must be notified to the affiliated members at least three weeks before it is due to take place or at least one day if the meeting of the extraordinary general assembly should take place during the national competitions. 4. When the extraordinary general assembly is convened on the initiative of the executive committee, this body must set the agenda. When it is convened at the request of a simple majority of all the members, the agenda must contain the points raised by those members. 5. The agenda may be modified provided a simple majority of those present at an extraordinary general assembly are in favor of the modification. 6. There shall be a sitting allowance of $30 for all members attending the extraordinary general assembly. 7. Subject to approval of the general assembly, there shall be no sitting allowance payable if KIFA does not have the necessary resources to meet these costs. In this case, KIFA will provide bus fares to members attending the extraordinary general assembly. 1. The quorum for meetings of the general assembly is a simple majority of all affiliated members with two being the president or vice president and another one from the executive committee of KIFA, the chairperson of the Referees’ Committee, the chairperson of the Coaches’ Committee and the presidents or their representatives of not less than two member organizations. 2. If the quorum is not met, a second general assembly shall take place 24 hours after the first with the same agenda. There is no quorum required for this second meeting unless any item on the agenda envisages the amendment of the statutes of KIFA, the election of the president of the executive committee, the dismissal of members of organs of KIFA, the exclusion of a member and the dissolution of the executive committee. 1. The general assembly shall be chaired by the president of KIFA, or if the president is absent or unable to attend by the vice president. If the latter is also absent or unable to attend, the affiliated members present at the general assembly shall choose one from among affiliated members to chair the general assembly. 2. The president is responsible for ensuring that the meeting runs according to plan. 3. The minutes of the meeting must be coordinated by the general secretary, who must send them to the members within one month following the meeting. 1. The general assembly shall not make a decision on any point not included on the agenda. 2. The members exercise their voting rights through their official delegate(s) who has a single vote. The delegate(s) may not represent more than one member organization. 3. Unless otherwise stipulated in the statutes, decisions shall be taken by an absolute majority (50% + 1) of the votes cast by the official delegates voting. 4. Decisions relating to any change of head office, any amendment to the statutes and regulations, to the dismissal of a member of KIFA bodies, to the exclusion of a member or to the dissolution of the executive committee, require a majority of 2/3 of the votes cast by affiliated members. 5. Elections shall be carried out on the basis of an absolute majority (50% + 1) of the votes validly cast by the official delegates voting in the first round, and then on the basis of a relative majority (the highest number of votes) in the second round. In the event that the votes cast in the second round are equal, a new count shall be undertaken to separate the candidates. 6. Spoilt voting slips, blank voting slips, or any other forms of abstention shall not be included in the count of validly cast votes. 7. Voting for the elections shall be by secret ballot. 8. Other decisions, when voting is not necessary, shall be taken by a show of hands. If this method of voting does not result in a definite majority in favor of a proposal, the vote shall be taken by calling the roll. 9. In the event of a tied vote, the president shall have the casting vote. 10. Voting by proxy or letter is not allowed. 11. The decision taken by the general assembly shall come into force on the day after they are adopted, unless the general assembly sets another date or delegates this decision to the executive committee. 1. The executive committee shall consist of a president, a vice president, a general secretary and an assistant secretary, a treasurer and an assistant treasurer, 1 member of an executive committee from all affiliated members, the chairperson of the Referees’ Committee and the chairperson of the Coaches’ Committee. 2. Every candidate for the executive committee must be proposed by at least one member before the general assembly at which the election to the executive committee is on the agenda. 3. When a member loses its member status, the mandate of the person elected to the executive committee on its proposal is terminated at the next ordinary general assembly, unless this meeting decides to retain him in his function until the end of his mandate. 4. Candidatures must be sent to the general secretariat. The official list of candidates must be passed on to members along with the agenda for the general assembly at which the election is due to take place. 5. Every candidate for the executive committee must have already been active in football and must not have been previously found guilty of any criminal offence. The member(s) proposing him must be active in football. 6. The executive committee shall be elected at a general assembly. 7. If the election of the executive committee is conducted through other means, the election of these office bearers shall be endorsed or otherwise by the next meeting of the general assembly. 1. The length of the mandate of the president and other members of the executive committee is four years. The mandate of the president and the other members of the executive committee may be renewed by the general assembly. 2. If other members of the executive committee relinquish their duties, they shall be replaced immediately, for the remainder of their term of office, by the executive committee. Their appointment shall be endorsed or otherwise at the next meeting of the general assembly. 1. The executive committee shall meet every two months or as often as required to coordinate the progress of any football competitions ongoing at the time. 2. The president or vice president or general secretary shall call for meetings of the executive committee. 3. At the request of four members of the executive committee, the president must convene an extraordinary meeting within two weeks following the request. If the president does not convene the meeting within this time, one of the members who requested the meeting may do so. 4. The members must submit the points they wish to include on the agenda for the meeting to the general secretary at least one week before the meeting. The agenda must be sent out to the members of the executive committee at least two days before the meeting. 5. The meetings of the executive committee are not held in public. The executive committee may, however, invite third parties to attend. These third parties do not have voting rights, and may only express an opinion with the permission of the executive committee. 6. There shall be a sitting allowance of $20 for each member of the executive committee attending the meeting of the executive committee. There shall be no sitting allowance payable if KIFA does not have the necessary resources to meet these costs and if the number of meetings exceeds two during one football competition. 7. In the event when sitting allowance is not provided, KIFA will provide bus fares to members of the executive committee attending the meeting of the executive committee. 8. If there is no football competition ongoing, there shall be no sitting allowance if the number of meetings exceed six during the period from January to December. 9. The quorum for the meeting of the executive committee is six with one of them being the president or vice president. (r) to prepare game fixtures and publish results of the competitions. 3. The executive committee can make decisions on all matters, which are not exclusive to the general assembly, with the exception of matters referred by this Constitution to other bodies. 1. The executive committee shall make decisions by a simple majority of the members present. In the event of a tied vote, the president has the casting vote. Absent members may not vote. 2. Any member of the executive committee must withdraw from the debate if there is any risk or possibility of a conflict of interest with a member. 3. Except in the event of a withdrawal, each member must express his opinion. 4. The decisions taken are recorded in the minutes. 5. The decisions taken by the executive committee shall come into effect immediately, unless the executive committee decides otherwise. (d) to ensure the effective function of the organs of KIFA to allow it to achieve the objectives specified by these statutes. 2. If the president is unable to carry out his duties, the vice president shall perform such duties. If the latter is also unable to carry out such duties, one of the members of the executive committee shall perform such duties. 3. If the president ceases to carry out or is prevented from performing his duties, the vice president shall undertake them until the next meeting of the general assembly at the latest when the general assembly shall elect a new president. 4. The president shall have an ordinary vote and, when votes are equal, shall have the casting vote. (e) representing KIFA at meetings KIFA is invited to attend when the president and vice president are unable to attend. 2. The general secretary shall be assisted by an assistant secretary. The assistant secretary has the same duties as the general secretary but should consult first the general secretary before carrying out such duties. (d) preparing the budget of KIFA to the executive committee for consideration and approval by the general assembly. 2 The treasurer shall be assisted by an assistant treasurer. 1. There shall be an external qualified auditor who shall check the accounts of KIFA and he/she shall present his/her report at the general assembly, with a view to formally approving the actions of the executive committee. 2. The external auditor shall be appointed by the general assembly and his/her tenure shall be determined by the general assembly. (i) loss of a match. (n) life ban for serious offences. 2. The executive committee shall draw up a disciplinary code to be observed by members. 2. Without prejudice to the areas of authority devolved to the general assembly, the above bodies are authorized to impose the various disciplinary measures stipulated by these statutes and other KIFA’s regulations. 1. The complaints committee shall consist of any one member of the executive committee who will act as chair, the referee, the two assistant referees and the fourth official in the match where the complaint originates. 2. The function of this committee is to consider and resolve complaints arising from football matches and to settle them in line with the IFAB Laws of the Game and KIFA’s rules governing the conduct of football. 3. The committee shall only consider and decide on complaints and disputes that are not declared final by the IFAB Laws of the Game. 4. The committee shall convene a meeting to consider and resolve complaints and disputes so that a decision on the matter does not hinder the progress of the football competition ongoing at the time. 5. The committee shall pass decisions when one member of the executive committee, the referee for the match where the complaint originates and at least two other members are present. 6. The team lodging the complaint and the team against which the complaint is lodged should be invited to attend the meeting of the committee but the meeting of the committee can go ahead even if one or two of these teams do not turn up to the meeting. 7. Decisions pronounced by the committee shall be binding on all the parties concerned. 1. The appeals committee shall consist of the executive committee, the referee, the two assistant referees and the fourth official in the match where the complaint originates. 2. The committee shall be chaired by the president or vice president if the president is unable to attend or any one of the other members of the executive committee if the president and the vice president are unable to attend. 3. The function of this committee is to consider and resolve appeals to the decisions of the complaints committee. 4. The committee can consider and resolve complaints and disputes arising from football matches and to settle them in line with the IFAB Laws of the Game and KIFA’s rules governing the conduct of football without going to the complaints committee first. 5. Matters that have been decided in the affirmative or negative cannot be considered again by the complaints committee. 6. Appeals to the decisions of the complaints committee shall be lodged in writing to the general secretariat no later than 24 hours after the decision of the complaints committee has been delivered. 7. The committee shall only consider and decide on complaints and disputes that are not declared final by the IFAB Laws of the Game. 8. The committee shall convene a meeting to consider and resolve disputes at an appropriate time to allow these disputes to be resolved in a timely manner and will not hinder the progress of the football competition ongoing at the time. 9. The committee shall pass decisions when at least 3 members of the executive committee, the referee for the match where the complaint originates and at least two other members are present. 10. The team lodging the complaint and the team against which the complaint is lodged should be invited to attend the meeting of the committee but the meeting of the committee can go ahead even if one or two of the teams do not turn up to the meeting. 11. Decisions pronounced by the committee shall be binding on all the parties concerned. 1. There shall be a grievances tribunal, which shall be responsible for resolving appeals to the decisions of the appeals committee and other disputes arising from players, clubs and members in line with IFAB Laws of the Game, KIFA’s rules governing the conduct of football and other applicable laws and minutes. 2. The tribunal shall comprise of five members to be appointed by the general assembly. 3. The chairperson of the tribunal shall be chosen from among those members present at a meeting. 4. The quorum for the meeting of the tribunal is three and the decisions of the tribunal over complaints and disputes arising from football matches shall be final and binding to all parties concerned. 5. The appeals on the decision of the appeals committee shall be made to the tribunal through the executive committee within 24 hours of notification of the decision. 6. Other complaints and disputes not associated with football competitions shall be forwarded in writing to the executive committee and a meeting of the tribunal shall be convened within one week. 7. The general secretary or the assistant secretary of KIFA shall be the secretary of the tribunal. 8. The tribunal may invite to the meeting persons to present facts relating to the appeals and complaints. 9. The members of the tribunal are entitled to a sitting allowance of $50 per meeting, which should be provided by the member association, team or individual for whom the meeting of the tribunal is called. 1. There shall be an arbitration tribunal, which shall be responsible to resolve any disputes between KIFA members, players, officials and licensed match agents and players’ agents. 4. The arbitration tribunal is empowered to deal only with appeals against decisions and disciplinary sanctions of the last instance, after all previous stages of appeal available have been exhausted. The appeal shall be made to the arbitration tribunal through the executive committee within 10 working days of notification of the decision. 5. The arbitration tribunal shall not hear appeals on violations of the Laws of the Game. 6. The arbitration tribunal shall use the various statutes, regulations and decisions of KIFA and other applicable laws of Kiribati. 9. The members of the tribunal are entitled to a sitting allowance of $50 per meeting, which should be provided by the member association, club or individual for whom the meeting of the tribunal is called. (f) to deal with public relations. 2. Staff of the general secretariat shall be appointed by the executive committee. The financial period of KIFA shall begin on 1 January and ends on 31 December every year. (f) other subscriptions and receipts in keeping with the objectives pursued by KIFA. (f) other expenses that the general assembly sees fit for the administration of the general secretariat. 2. Allowances referred to in (c), (d) and (e) above should only be payable if KIFA has the financial resources to meet these costs otherwise a bus fare should be provided. 3. The trustees for KIFA’s bank accounts are the president, vice president, and treasurer. The accounts shall be kept in accordance with the appropriate principles of accounting. In the event of dissolution of KIFA, the net assets shall not be distributed but should be kept in the accounts of KIFA until the re-establishment of KIFA. (d) other football competitions approved by the executive committee. 2. The executive committee may delegate to their subordinate member associations the authority to organize their own district competitions. 3. The competitions organized by subordinate members cannot interfere with those competitions organized by KIFA. If this is the case, competitions organized by the latter take priority. 1. Any matters not provided for under this Constitution shall be settled by the general assembly. 2. Decisions in matters of legislation shall not become operative until they have been approved by the general assembly and supported by 2/3 majority of all members. 3. Should there be conflict between this Constitution and the decisions of the general assembly, this Constitution shall prevail.